Shimon Walt is the Assistant Principal Cellist of Symphony Nova Scotia (SNS). Since arriving in Nova Scotia in 1976, he’s been an integral part of this province’s musical life. A founding member of Symphony Nova Scotia, Shimon was appointed by the provincial government to a steering committee entrusted with rebuilding symphonic life in Nova Scotia after the demise of the Atlantic Symphony Orchestra. He was SNS’ first Personnel Manager, a position he held for six years. Shimon was educated in Tel Aviv and Boston, where his teachers were Uzi Wiezel and George Neikrug. He has performed with major orchestras under noted conductors such as Leonard Bernstein, Zubin Mehta and Pablo Casals. Today he shares his time between Symphony Nova Scotia, Dalhousie University and Rhapsody Quintet, with whom he has performed extensively in Atlantic Canada and Ontario, most recently at the National Arts Centre in Ottawa. A dedicated teacher, many of his students have gone on to professional careers in music. 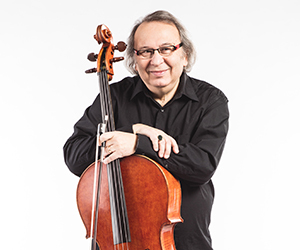 Shimon has adjudicated for music festivals in Ontario, Nova Scotia and Newfoundland, and served on juries for FACTOR and the Canada Council for the Arts. He is is the Artistic Advisor for the Mahone Bay Music at Three Churches Concert Series. As a musician and contractor, Shimon has provided musical services to many artists including Michael Bublé, Kanye West, Anne Murray, Sarah Brightman and John Denver. He’s made six recordings with Rhapsody Quintet and organized music for royal visits, the Prime Minister of Canada and other visiting heads of state. As a collaborative musician playing chamber music, accompanying choirs and singers, or making a guest appearance on a jazz or pop recording, he is totally dedicated to the art of music. He was Artist in Residence for the Saint Cecilia Concert Series in 2012-13 and received an Established Artist Award from the Creative Nova Scotia Leadership Council in 2012. Shimon enjoys giving lectures on music to university students and library patrons, and master classes to music students at Ottawa University. In 2017, he gave the premiere performances of a major new Canadian oratorio for cello, piano and choir, Crimson Stain by Vancouver composer, Larry Nickel, with the Halifax Camerata Singers.